fraught with unforeseen changes, and deep transformation. eclipses, and this most recent one had been particularly brutal. or bafflement at astrology’s verity, all that is evaporated now. that all of my horoscopes lately have been shockingly accurate. 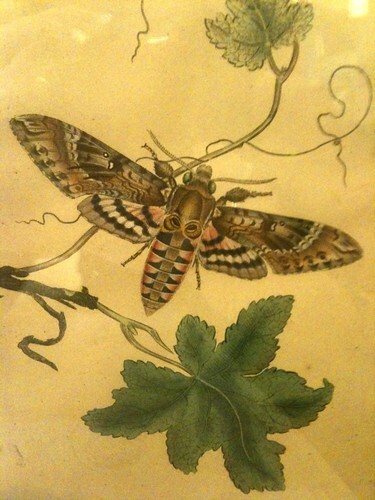 of fantastic resources, namely, Mary K. Greer and John Coulthart. loved good old Astrodienst. Got any recommendations for me? be doing the trick so far. 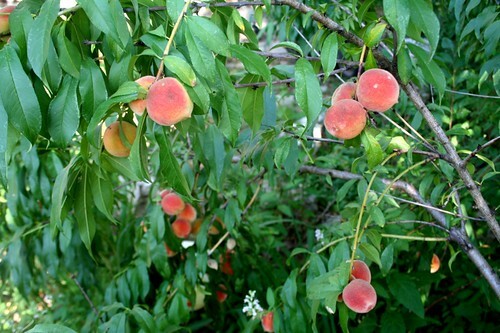 We have a peach cobbler in mind! all the way. I’m a big advocate of kitten or puppy therapy. of rather than just sitting around feeling sorry for yourself. I’ll try and post regular photos of his progress to boost morale! be here in just a matter of days! I cannot wait to frolic and watch fireworks with him! seeds that never made it into the ground – I wonder if they’re still any good? 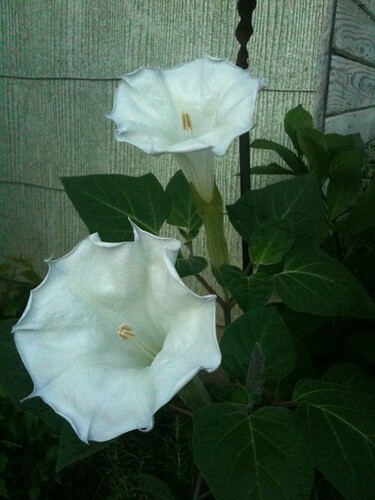 In lieu of moonflowers, we’ve got loads of angel trumpets, oh heavenly datura! Ooooh ! That Pamela Colman Smith is to die for ! 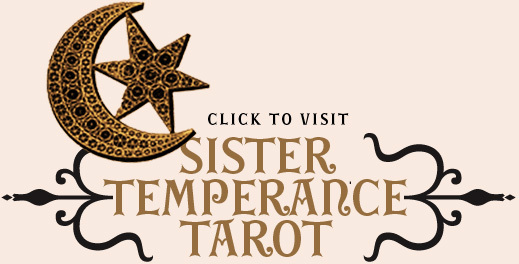 I try not to collect Tarot Decks but kinda fail … ha ! The fancy ones just don’t work that well. So I see pretty much what you mean. it’s been a very trying time for me as well – five weeks ago my whole world changed. it’s been a very difficult road and i’m sorry to hear that yours has been rocky as well. the kitten is so cute i love him. i’d be a total sucker for that face as well. from this darkened cave over here. I have had a rocky week as well. I am growing up real fast these days, and sometimes it hurts a lot. I’m really trying to be less selfish and more of an adult, but I never realized I had so far to go before that happens. I should really write you a letter soon. It is definitely a time of upheaval and endings here, almost immediately after the lunar eclipse. Although my astro profile for the next year pretty much makes that the main theme. I used to have that deck a long time ago. I made giant murals of several cards on my walls, the fool, the two of wands, the hanged man, the three of swords, and I think the wheel of fortune. Not sure what I did with that deck, but I later obtained an egyptian deck and a norse deck. I really liked using both decks at the same time to compliment/supplement each other because of the different energies. yup, i feel you on the craziness/major changes/shifts/upheavals. and it doesn’t seem to be letting up either! in any case, i suppose we’re all getting pretty good at ‘rolling with the punches’. and in a weird way, freefalling feels kinda liberating. lately i just throw my hands up and say: anything goes, bring it on bitchezzz! Thank you for your thoughts, and for your sweet words. I’ll be thinking of you as well – I hope things get better for you soon! I’m waving at you from my cave! Hopefully we won’t turn into blind albino salamanders, eh? Out into the sunlight soon, yes? Oh little Mr. Renfield B. W.! I got all teary-eyed reading about his story … sadness and happiness all mixed up together. 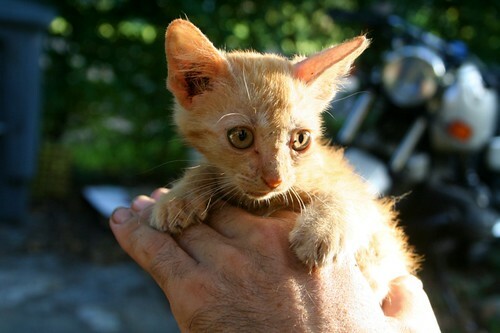 Poor little puddykins, but lucky little fellow too!! If I lived near you, I would offer to adopt this little charmer in a second, despite the angry looks of our Miss Penelope Nut, who would be in complete agreement with Mr. Rusty J. in not approving of a younger sibling. But it does sound as if he has won your heart, and so a wonderful, wonderful home! 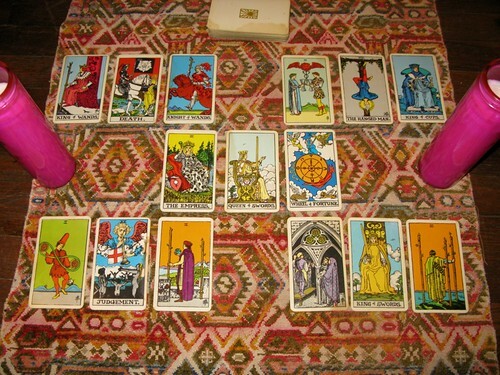 We have been experiencing some serious shifts in life too, and I wish I understood more about tarot so that I could really understand what your reading shows. Perhaps the peaches and pomegranates and beautiful angel trumpets are a sign that things are going to get better … I hope so!! Sending many best wishes your way! That flower unfurling video was so lovely and inspiring. . . the beautiful things, the truly good things in life take time. And I totally feel you about the times we are in. My life has been just so much lately, so much coming at me at once, good, bad, and everything in between, I need a breather! I may just take the time to retreat inward soon as well! As always, your bee-log is inspiring and refreshing. Big changes and shifts right now for me too! And one of those times when it feels like the muse has left for a while- though I know she will return. Your reading seems really balanced but I can’t say too much, not familiar with the layout. 3-2s, 3 kings, a queen and empress, the great transformation and wands galore- certainly creative change but looks balanced and right. It’s always good to hear from you, dear. Thank you for your sweet thoughts. in the universe, and knowing there is good in store! I’m glad you enjoyed the datura video! and that it brings some good your way. Teatime please, and junking – soonly? You have a wonderful garden/orchard going, and I am way jealous of it. I am also jealous that you have a home of your own and not stuck in a basement suite like I am!! Count your lucky stars!! 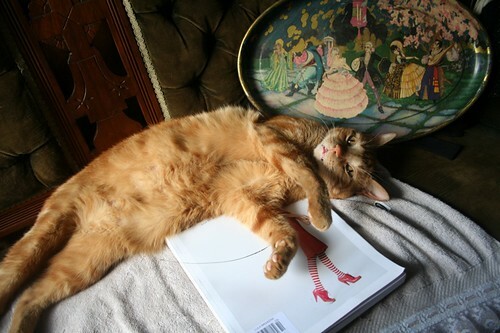 Aw, Bojangles is gorgeous – so glad he found you. I’m going through a weird transitional phase right now, too – probably partly because of the upcoming move to Austin, but because of other things too, I think. Thank you! I do indeed count my lucky stars for my home and my garden, every day. Having a real garden is such a joy – for years, when I lived in New Orleans, I only had balconies. Being able to plant things directly into the earth rather than pots is magical. I hope one day you will be able to come out from the underground and have one of your own! Me too! He’s such a sweetheart. Everyone seems to be going through such changes right now! I hope yours go smoothly, and your move is relatively painless. We are really looking forward to frolicking with you here in Austin!